The incumbent Democrat faces Republican Kevin Cramer in a red state. When to support the president and when not to is a major issue in the contest. CROSBY, North Dakota — In one of 2018's hottest Senate contests, it's a matter of putting North Dakota voters first, while not straying too far from President Donald Trump. Democratic Sen. Heidi Heitkamp, a moderate, is facing a tough challenge this November from Republican Rep. Kevin Cramer. The three-term congressman was recruited to run by President Donald Trump in a state that he won by almost 36 points in 2016. And while Heitkamp has won with conservative winds at her back before, the state has only shown itself to be redder since her 2012 Senate victory. Even on the sidelines of the State Fair in Minot over the weekend, voters of all political stripes were keenly aware that this was still Trump Country. "Trump, Trump, Trump. Everything here's Trump," Duane Henry told NBC News as parade-walkers rained candy down on onlookers. Hence the delicate dance for both candidates: Heitkamp pitching herself as a lawmaker who won't be "a rubber stamp for anybody" and Cramer — proud to show off his pro-Trump credentials — trying to assure voters that despite his support of the president, if it comes down to them or the president, he's with them. "I support North Dakotans, I'm a North Dakotan, I don't apologize for being a Republican," Cramer told NBC News. "I never have to say, you know, 'I'm really breaking with my party all the time so that I can be more like him.' … And for those occasions where you have to break away and do the right thing for your state, I’m all about it." It's rare to hear Cramer criticize Trump, but in recent weeks he has asserted his independence on tariffs and U.S.-Russia relations. But he's also the same lawmaker who once likened voting against Trump to cheating on one's spouse. 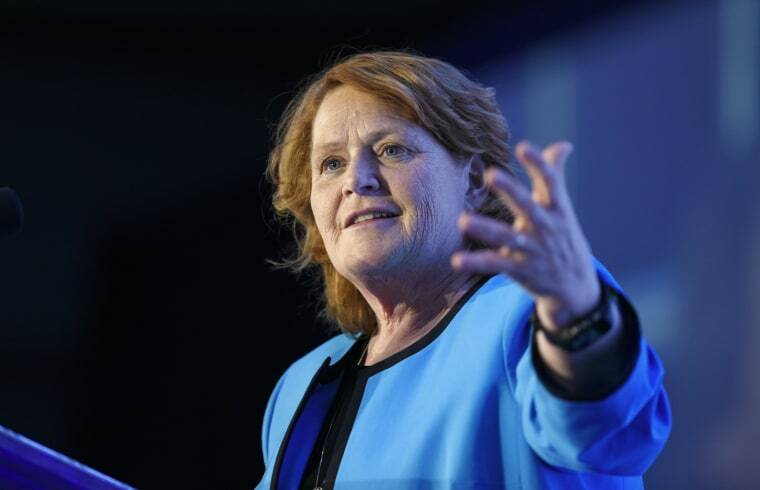 Attacking Heitkamp’s bipartisan pitch to voters, Cramer told the Scott Hennen radio show in April that he's "heard her say, 'Gee, I voted with him 55 percent of the time.' Can you imagine going home and telling your wife, 'I've been faithful to you 55 percent of the time?' Are you kidding me?" Asked if there are any issues where Cramer would be "willing to cheat on the president," he pointed out that he doesn't “have a 100 percent voting record with him right now…so I obviously am." But many voters who spoke to NBC News over the weekend, both pro-Trump Republicans and Democrats, feel that's what they already have in Heitkamp. Elsa Binfield called Heitkamp a senator with "guts." "She pretty much says it straight," Binfield said, moments before Heitkamp’s shock of red hair entered the parade fray. "She is a person that…will swing both ways at the door. So if you are a Democrat or a Republican, if she likes it, she's going to vote for it." Further north — in Divide County — Royce Potteiger hoped voters could look at Heitkamp's bonafides. "I'd like to think that (the people of North Dakota) are smarter than that — to just vote party, because I think that Heidi Heitkamp, in my opinion, has done a good job of supporting the people here. She votes for the people here in North Dakota…I do think that the people here will vote for the person who is supporting them," Potteiger said. Heitkamp narrowly won her Senate seat in 2012 — by less than one percent — against the backdrop of a Mitt Romney wave of support in the state during the presidential contest. One of the places where she eked out a win was in Divide, a roughly 2,400-person county in the northwest part of the state. It's a county that has voted more Republican since Heitkamp's name was last on the ballot, with well over half the county voting for Trump in 2016. Fans of Trump here aren't necessarily turned off by the "D" next to Heitkamp's name, though. Voters here, and at the State Fair in Minot, point to her decades of public service and deep personal ties to the state. "She's pretty well liked in North Dakota," Henry, a Trump supporter who says he'll vote for Heitkamp in November, said. "She knows a lot of people. She gets out and meets a lot of people." Moments later, her personal reach in the state was on display: As Heitkamp descended on the State Fair parade, an onlooker pulled her aside for a quick hello and to mention that he knew the husband of one of her sisters. But Divide locals, like Rod Gillund, said that "because of the conservative nature (of) the community at large here, I think it's going to be really complicated" for Heitkamp. It might be complicated, but not impossible for the lone Democrat in North Dakota's statewide delegation to overcome. In fact, in over a dozen conversations here and at the State Fair in Minot on Saturday, few people discounted her for being a Democrat. And on the upcoming Supreme Court nomination, Heitkamp told NBC News she wouldn't let party politics get in the way there, either. "It's more important that you judge these nominees based on who they are as a person," she said. "Until you meet someone and review their record, and I think, quite honestly, see the hearing, I don't think anyone should be making up their mind." She added, "What I find kind of almost mind-boggling is the fact that you have people on one side, on the left saying, before you even name someone, saying, 'Yeah, I'm not going to vote for that person' and people on the right saying, 'Well, you’ve got to support whoever the president nominates.' That's not what the Constitution meant when it said 'advise and consent.'" Paul Fritz, who supports Trump and Cramer, said he wants his senator to "vote in line with the president as long as everything is good and going. I mean, if something's really strange going on, Kevin is the type of guy that will push back a little and says this may not be right." That kind of independence is a rarity in Washington, where much is decided along party lines before the debate even starts. But voters in North Dakota seemed to like independence in their legislators — so long as it's done with their best interest in mind. "I would hate to say that just because President Trump says that this is the person, that everybody should fall in line. That's not the way this country works," Potteiger said. "So, I would hope that she doesn't just vote because Trump says so and I would hope that the people would vote for her because she’s willing to stand up for what's right."